That was a quick change. 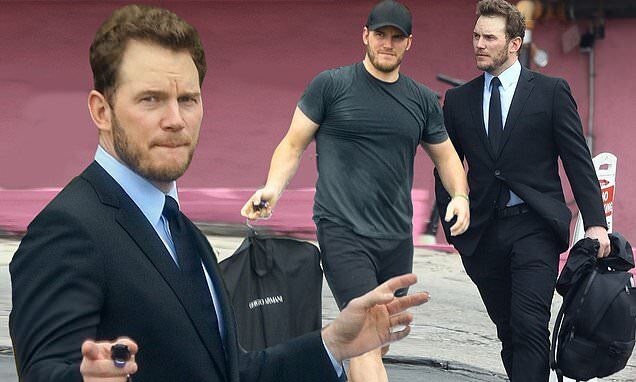 Chris Pratt was all sweaty when he was spotted carrying a suit bag as he left a gym in West Hollywood on Wednesday. The 39-year-old actor wore a black T-shirt that was ringing wet and soggy black shorts. With a cap on his brunette hair and desigher stubble, the Guardians Of The Galaxy star left his car wearing black sneakers. He emerged a little while later looking sophisticated in a black suit, blue shirt and black tie as he posed for snappers. Chris's hair was neatly quaffed and he had swapped his regular sneakers for a smart black leather pair.